School Pride? Wrap Your School Ride. It’s that great time of year where the music of marching bands wakes you up in the morning. The sounds of drums and trumpets – hopefully in the distance. School is back in session and that means Friday night games, concerts, plays, competitions and a whole lot of school pride. And if you’re wanting to show your school pride, HS Sign Shop can help wrap your ride. Whether your school trailer is hauling around football pads or band equipment, it can be wrapped. The look is seamless and very clean. Imaging your school name, mascot, bold colors and a driving advertisement for your school pride. 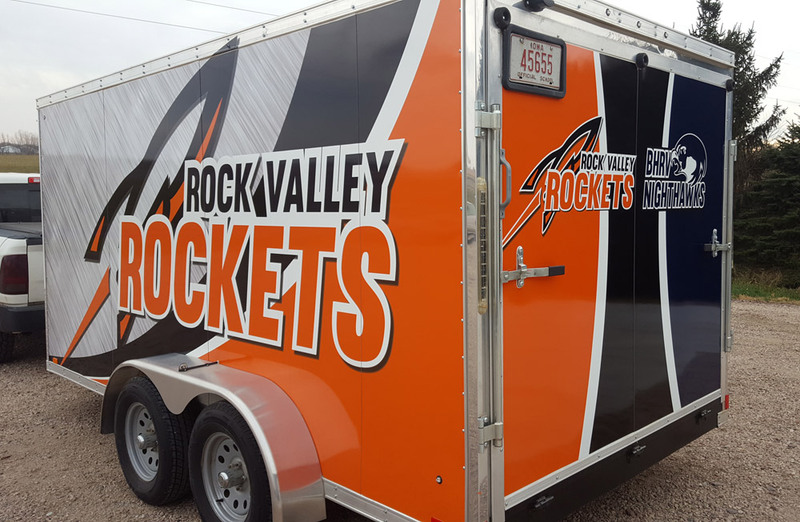 HS Sign Shop has completed a few trailer designs lately with outstanding results. So even if your team happens to drop that Friday night thriller, you can look great doing it. And it’s much less cost prohibitive than you may think. But it’s not just trailers that can be wrapped. Virtually about anything can be wrapped or applied with vinyl. Buses. Vans. Doors. Walls. Windows. Dividers. Gym Floors. You get the idea. Once, we even wrapped an entire RV. Talk about teamwork. So if you’re excited about the upcoming school year, but less than thrilled about your ride, talk to HS Sign Shop. We can help kick the year off right – and wrap your ride!